Galileo studied changes in the surface of the sun. Charles Darwin noticed differences in the beaks of Galápagos finches. Marie Curie observed uranium rays. Many important discoveries began with careful observation. 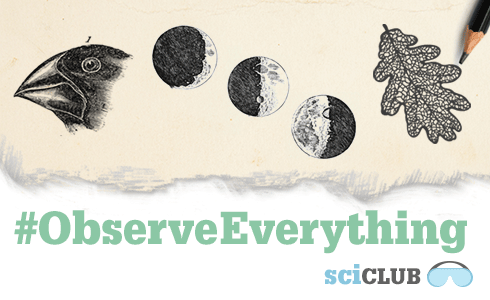 In this edition of Science Club, we challenge you to carefully observe and document something that interests you, be it a pattern, a change, or a trend that’s happening now or that occurred in the past. You can use a variety of techniques to make and record your observations, such as photography, video, drawing, data visualization, note-taking—any method that helps you share what you’ve seen in a way that tells a story, suggests a possible explanation, or raises further questions. Be curious, and make us curious too. There’s no limit to what or how you can observe, so long as you work safely, lawfully, and don’t harass any living organisms. In other words, use common sense, and please don’t interfere with the behavior or well-being of plants, animals, or humans. So many things can be observed passively for this project—planets, pavement, plants, people, popovers, pustules, and even penguins. If you’re using previously-collected data, get permission to use it and provide a citation. Check out our Projects Policy here. How can I make good observations? Good observations start with consistency—observe something in the same way, at regular intervals. Explain how you’ve made your observations in case someone else wants to replicate your work or contribute data. Document your work—use photos, videos, drawings, charts, sounds, etc. to show what you’re observing. Most scientists have a notebook or journal in which they record their observations and thoughts. How can I share my observations? Post your photos, videos, and other forms of documentation online, and share them with us using social media. Or send us an image with a description of what you’ve observed. Be sure to explain what’s significant about your observation—that is, why it matters. You can participate on your own, with a citizen science organization or science class, or as part of your graduate research. Are you a practicing scientist? Share your techniques and tools, or tell us how you use observation in your research by sharing photographs, figures, sample data, or an anecdote about a time your observations paid off. Still need inspiration? We’ve pieced together some entry-level and advanced examples of projects for you to browse through here. I’m a teacher. Can I do this as a class project? Yes! Teachers can certainly submit student observations on behalf of their students. You may send us class projects, observations, lab data, figures from lab reports, or really any other form of careful observation conducted as part of an educational experience. If you plan to submit anything that includes the face or voice of a student under 18, however, make sure that you’ve received permission from a parent or guardian (e.g. a general media, photo, or press waiver). If you prefer that students submit their own observations, please guide them in best practices of Internet safety and privacy—for instance, instruct them to avoid including identifying personal information or images in their submissions. We assume that as a participating educator, you and your class are adhering to your school’s or district’s Internet use policy. Can I share my observations from a citizen science project? How do I do that? Yes! Many citizen science projects are all about good observation. They provide protocols and ideas for making observations, with the added bonus that the data you collect will support real scientific research. If you want to submit observations collected as part of a citizen science project, please make sure to include the Twitter handle or URL of the citizen science project as part of your submission.